A fish tank can be a handy solution for people who want pets but don’t have the time to commit to the type of pet who needs constant care. Aquatic life is fascinating, fun and, comparatively speaking, needs much less attention than more traditional pets. However, there are some fish you might want to steer clear of — like the piranha. We’ve all seen the movies where the hero narrowly makes it across a river teeming with these seemingly vicious, man-eating fishes who will strip a person’s flesh from their bones in a matter of seconds. While piranhas don’t warrant that exaggerated kind of reputation, they are definitely not the kind of fish you want unless you have a very specialized environment. Piranhas are freshwater fish, typically native to South American rivers. They are omnivorous, consuming both other animals and plants. Piranhas can grow up to 2 feet in length and at adulthood weigh in somewhere between 7 to 9 pounds. These fish are predatory — they’ll go looking for food, and with their powerful bite and razor-sharp teeth, they usually have no problem finding and overpowering it. Piranhas swim in schools, but while this does provide an advantage in bringing down larger prey, their schooling is mainly for self-defense from other predators. The first roadblock to keeping piranhas will be the law. These fish are illegal to own in many states in the U.S., so your first step will be contacting the authorities and asking if keeping piranhas is allowed. Typically, you’ll be discussing this with the state’s fish and wildlife organization. Animals like piranhas are strictly regulated. The most obvious reason is because these fish are dangerous when not cared for and handled appropriately. 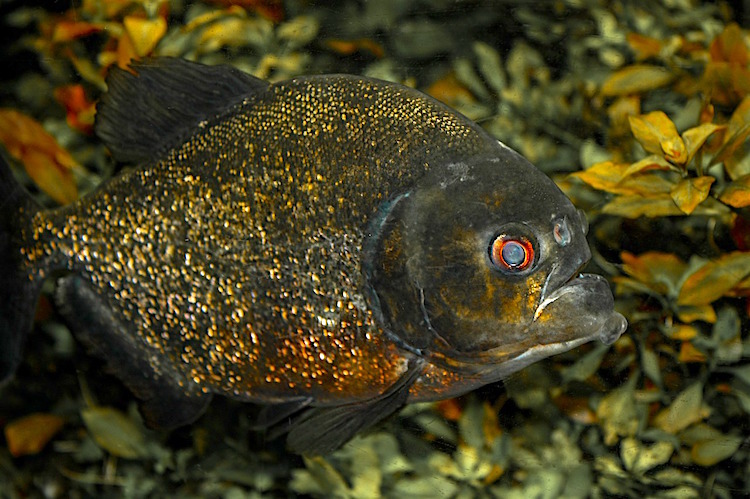 While you’re highly unlikely to be devoured by a fish in an aquarium, piranhas are capable of causing severe bites. Another reason these fish are outlawed is to protect the ecosystem. Should someone release an animal into a foreign ecosystem, this animal can cause massive imbalances by introducing new parasites, diseases or by inserting themselves into the prey/predator cycle, throwing it out of balance and causing some species to become over-hunted or starved and die out. The states take this law seriously. For example, in Massachusetts, if it is discovered that you keep a piranha or other prohibited animal, your animal will be seized and you can be fined up to $5,000 per animal. You may also be assessed administrative fees up to $500. Unsurprisingly, piranha will consider most other fish in the tank to be prey and react accordingly. This is not the type of fish you want if you’re looking for a diversified tank. These fish get close to their prey by pretending nonchalance — in the wild, they’ll often seem disinterested when near another fish, until that fish gets too close. Then it’s curtains for the prey fish. So you may think your piranha isn’t paying attention when you stick your hand in the tank, but believe me, they are. These bites will be serious enough to require immediate first aid. 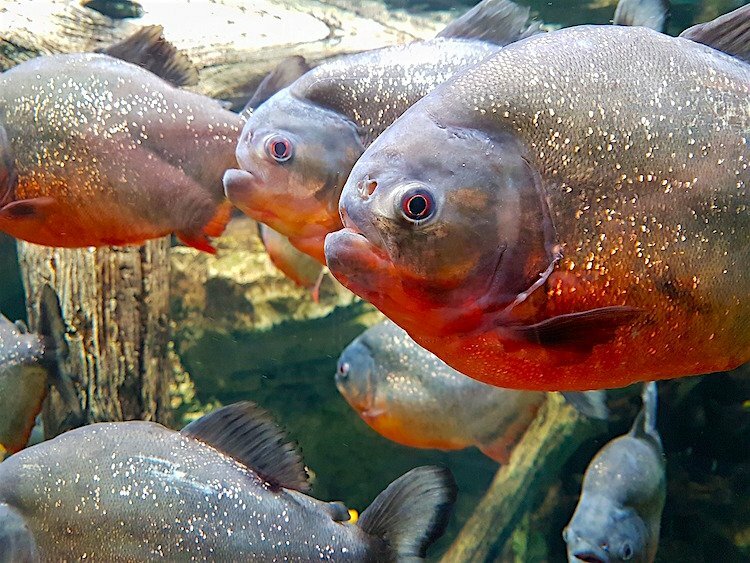 Keeping piranhas means you are going to have to clean their tank regularly and safely — a complicated procedure when you’re trying not to get close. In addition, you will be responsible for keeping other people away from the tank. While it seems obvious that sticking your hand into a tank full of piranhas is a terrible idea, simply checking your social media feed will show you how often people really do stupid things like this. And if someone is injured by your piranha, guess who’s responsible? In the eyes of the law, you are. These fish perform an significant role in the South American ecosystem. They’re scavengers who keep the rivers clear of decaying animals, and they help control overpopulation of other fish. Once taken out of their environment, however, the piranha does not always manage well. Some have stunted growth, others cannot or will not reproduce. Taking the piranha out of their natural environment really does a disservice to both the fish and their native ecosystem. Stick to watching these fish on television and in their proper habitats. If you’re hankering for a fish tank, there are many other varieties of fish that are fun and interesting — and who won’t view you as a menu item.